Growing up, I hated when Dad made me get in the garden to do anything. He usually had me pulling weeds or running the ancient front-tine tiller. Now, years later, I’m married, have a home of my own and a garden. I believe Becky and I have had a garden every year since we’ve been married. Now I see gardening as an enjoyable chore…not only do I get to eat good food out of it, but I enjoy getting outside and doing the work. It gives me time to think about different things, talk to the Lord and think about His goodness to me. A few weeks ago I put out a few seeds. All of that has started to come up now. I’m always amazed at how God made those seeds to bring forth such big plants that give so much food. It also makes me think about the law of sowing and reaping in life – what little you sow will be reaped that much more. Today was a good day to get out and do some work too. 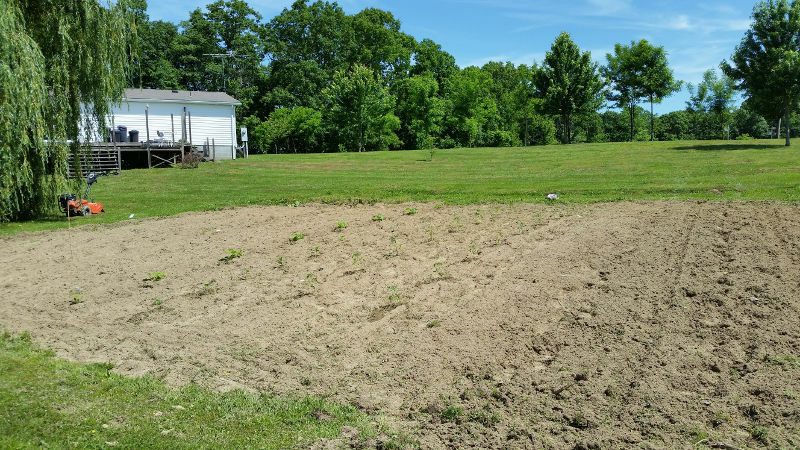 In total, I’ve put out okra, squash, cucumbers, watermelon, tomatoes, onions, peppers and corn. Now I can’t wait for all of that to grow and we can start eating out of it. By far, our favorite is fried squash. Probably not the most healthy way to eat it, but it’s surely the most tasty.